A clone is a bootable backup of your Mac’s hard drive that provides redundancy for both your data and the Macintosh Operating System. 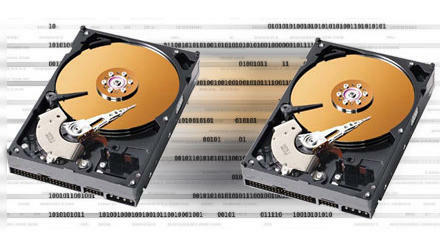 Cloning is easy to do and is complementary to other backup methods like Time Machine. The ability to get up and working in minutes after a crash or system update gone awry can be a very useful thing. Clones provide a way to rollback your Mac OS X installation. You can keep your clone updated using synchronization software to perform incremental updates, and can use your clone to boot another Mac should the need arise. You need a separate hard disk or partition for the clone. The disk should be large enough to hold all data on the source drive with at least 10GB to spare; it’s generally best to use a disk the same size (or larger) as the volume being cloned. 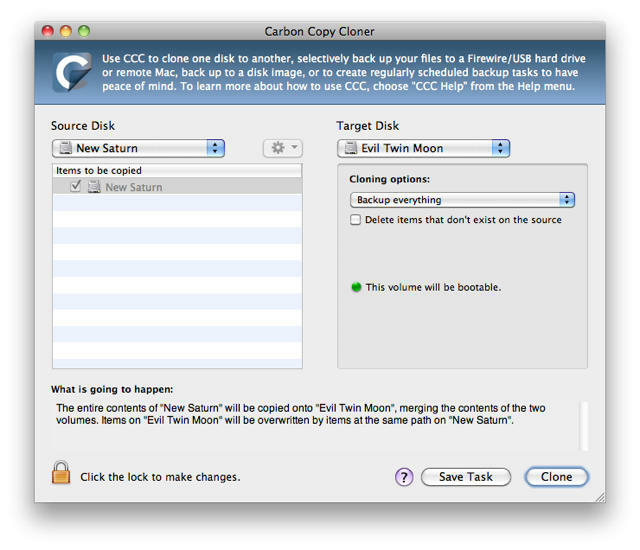 The cloning process erases the destination drive, copies all files from the source drive, then makes the clone drive bootable. You can use an internal or external drive for the clone, with external being more common and flexible. Intel Macs can boot from external FireWire or USB drives, PowerPC Macs require FireWire drives. 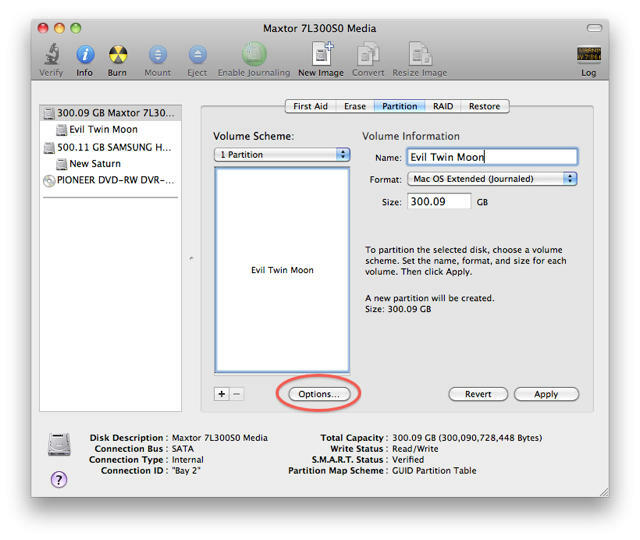 Use Apple’s Disk Utility to Partition the drive. Click on Options… to set the type of partition. 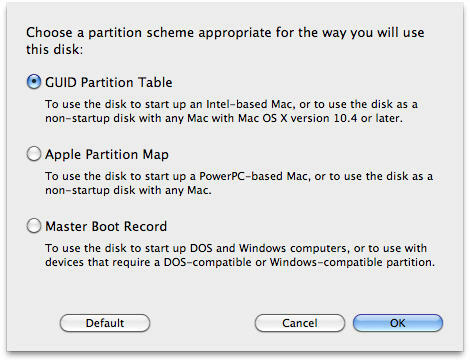 For Intel Macs the clone drive should be partitioned using a GUID Partition Table. For PowerPC Macs use Apple Partition Map. The essence of the cloning process is copying data from one drive to another. However, unlike in the Classic Mac OS you can’t just drag and drop via the Finder to copy an OS X boot volume. There are a number of invisible files, symbolic links and permissions which need to be copied or recreated to make a bootable system. The process utilizes the UNIX ditto command and can be done from Terminal, but running a standard Mac app is easier for most people. Cloning with Carbon Copy Cloner or SuperDuper! There are a number of utilities you can use to clone your Mac’s drive. Two of the oldest and most popular are Carbon Copy Cloner and SuperDuper! Both are reliable and capable. I generally default to CCC out of habit (in the pre-Jaguar era this was the only such utility available), and because its developer works for Apple (though Cloner is not an Apple product). SuperDuper! has more features and is a bit more useful as automated backup software. The process is simple with both programs. Select your source and destination volumes, choose your cloning options, start the process and wait for it to complete. You can continue to use your Mac while the cloning process is running, though I prefer not to tempt fate. Total time required depends on how much data you have and how fast your drives are. Could take anywhere from a Coffee Break to Dinner and a Movie. If you have a really large system (several hundred GB of data), run the clone overnight. Once complete test that your clone works to boot your Mac. It’s not fun to find out you have a bad backup months later when you need it most. Go to System Preferences –> Startup Disk, select your clone as the boot drive, then Restart your Mac. Once you’re sure it works, repeat the process to reset your internal drive back as the startup disk. 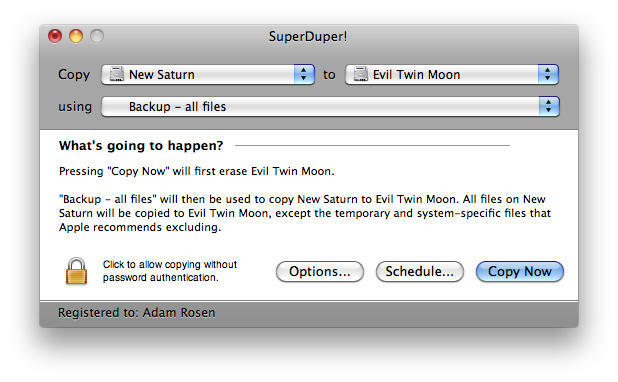 Once you have a working clone, Incremental Backups can be used to keep the clone’s data up-to-date. 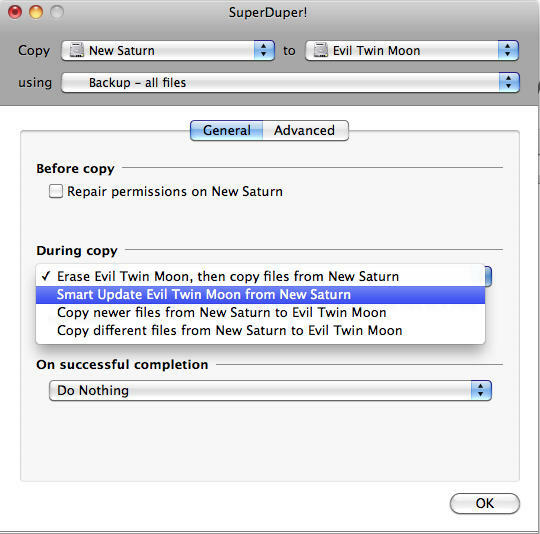 An incremental backup copies only items which have changed since the last backup, so it’s much quicker to run than a full clone. You can choose to keep the entire drive updated, or just a subset of files (e.g., your home directory). Another good program for performing incremental backups is ChronoSync. This handy utility works with both local and networked systems, offers sophisticated logging and filtering options, and can be scheduled for automatic operation. I use ChronoSync to handle disk backups for my business clients. I suggest making full clones of your Mac every 3 to 6 months. I typically run interim backups daily, or as necessary after making changes to my system. The clone and subsequent incremental updates serve as a backup of your data. No special software is needed to read the files on a clone, it’s just another Mac hard drive. You can easily find and copy files as needed. It’s worth cloning your Mac before you install any major updates to Mac OS X, QuickTime or major business and productivity applications. If you run into problems you can then boot off your clone and keep working, then when time permits you can perform more troubleshooting, or erase and reclone the older system back to the primary drive. This can be very useful. 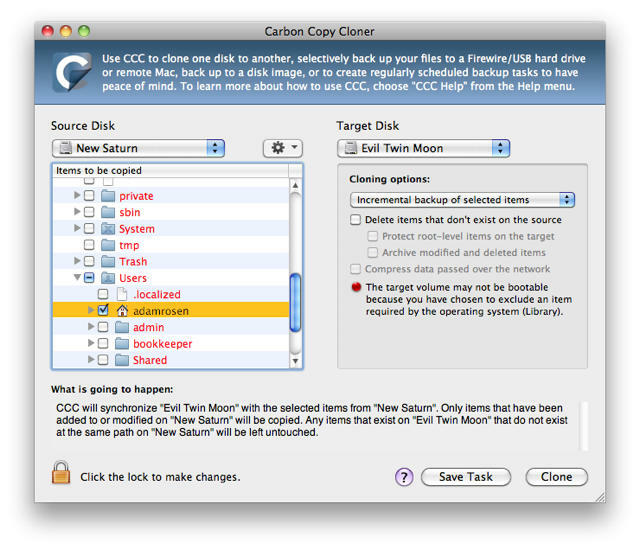 One drive can be used to store clones of multiple Macs, each on it’s own partition. This is often a good compromise in a small business situation when regular incremental updates of each clone aren’t needed. A clone isn’t tied to one particular machine, it can boot any Macintosh which supports the installed version of Mac OS X. You can use the clone of an iMac to boot a MacBook, or an XServe clone to boot a Mac Mini (albeit with a slight difference in performance). This capability offers great mitigation against hardware failure, especially in a business with multiple similar Macs. It also allows you to carry your virtual computer with you on a portable hard drive. 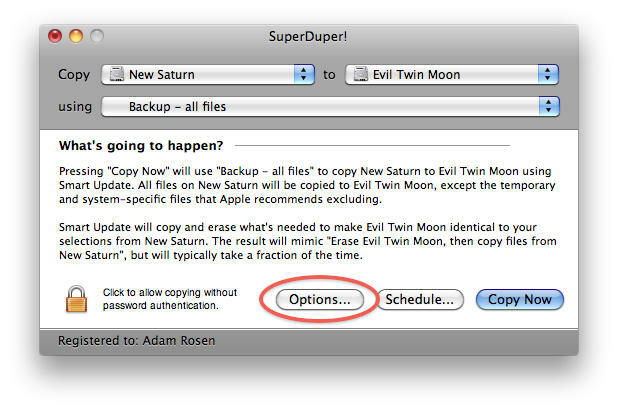 Cloning and incremental backups make good complements to archival backups like Time Machine. A clone is bootable and contains a single snapshot of your system; a Time Machine archive is not bootable but contains multiple versions of your files. I use both methods on my Mac Pro with multiple internal drives. One drive is my boot disk, the second is a clone that gets daily incremental updates, and the third contains my Time Machine data. Both types of backups have been helpful on different occasions.